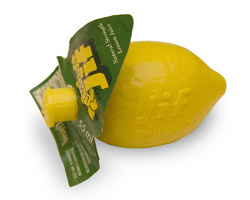 How can I reuse or recycle lemon juice (Jif) plastic lemons? | How can I recycle this? We had to buy a couple of those annoying plastic lemons to tide us over until we can get to another shop to buy it in a lovely, recyclable glass bottle. According to the plastic lemon, it can be recycled – but doesn’t give a resin code number so I don’t know what type of plastic it is. So any reusing or recycling ideas? Keep and reuse as Christmas decorations next year. Alternative water pistols for the children. I was just about to suggest “tie a red bow around its neck and hang it in the yule tree”! I use one to rinse off dirt and dust on the leaves of delicate seedlings. I actually think this saves a wee bit of water to, as I only use just enough to get the specks of dust off. I collect them and use them in a decorative fruit bowl… I bury it on the bottom so no one notices what it is. cut a scoop off the top and use it as a convenient/quirky coin bowl – following same lines use a row of them for growing herbs in the window sill. If you have smooth floors you could stick a marble inside and bit of cloth soaked in valerian – hey presto! instant cat toy (Oh I guess you’d need a cat or two in addition to smooth floors). using them to rinse delicate seedlings – also great idea – also possibly as a “watering can” for hard to reach pots? Childcare centres and small children you know would love these for playing house, play shopping, and kitchen play. A few in a small mesh bag with a fake price label would be fantastic for shopping play!! I was thinking the same thing. Instead of buying toy foods for me to play with, my mom would give me the real items after they were used. I had several of those single-use cereal boxes stuffed with cardboard and wrapped with packaging tape for durability. I had egg cartons, milk jugs, velveeta boxes, honey bears, and of course the fake lemons. Once it’s cut in half, could it be used as a mold for soap or a candle or what have you? Add some lemon scent, too. Fill them with paint, and make art! Even go to a fair, and they have a piece of paper on something that spins rapidly, and you squirt paint on it while it spins for a fun design? Look up Spin-Art. Bobbers or corks for fishermen? You know, those floating things tied to your line or net, that mark where your line is in the water. Fill them with water and freeze-leaving a little room for expansion, and tuck one in your lunch, or a few in your picnic basket, to help keep things cold. Use over and over again. Yeah, boaters might like them as floats for lots of things, like keyrings that make your keys float for long enough for you to fish them out again if you accidentally drop them in the canal. They’d also be lots of fun as swimming pool toys, since they both float and squirt. And might the dog enjoy chasing or drinking some water squirted at her in the garden in the summer? Years ago while travellling through the East Coast of Canada, I had the pleasure of visiting Andy’s Dummy Farm. Rattle toy for a baby. Hang them on your lemon tree for extra buzz about your harvest. :) Incorporate them into a wreath. Fill them with fresh squeezed lemon juice. Fill them with tiny candy and give as a gift. Fill with soil and plant a lemon seed in it. Cut in half length-wise and use to serve snacks. Make a little dwarf hat. Cut the slit and use to collect coins. Place inside it small bulb and you’ll have a unique lamp. Carry water or another drink in it. Fill it with sand and use as paper weight. Cut one side and make a boat for a child. Cut one side, so it turns into a small bowl, and serve lemon slices in it. Make “Lemon Body” doll. 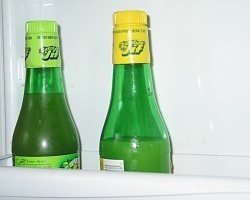 Use plastic lemon as a head etc.